I need to tell everyone about these NOW!! Zucchini chips rawk!! Made this batch in my dehydrate last night and am scarfing them down as my morning snack. I clearly need to make more next time. Or not share them with the hubs. 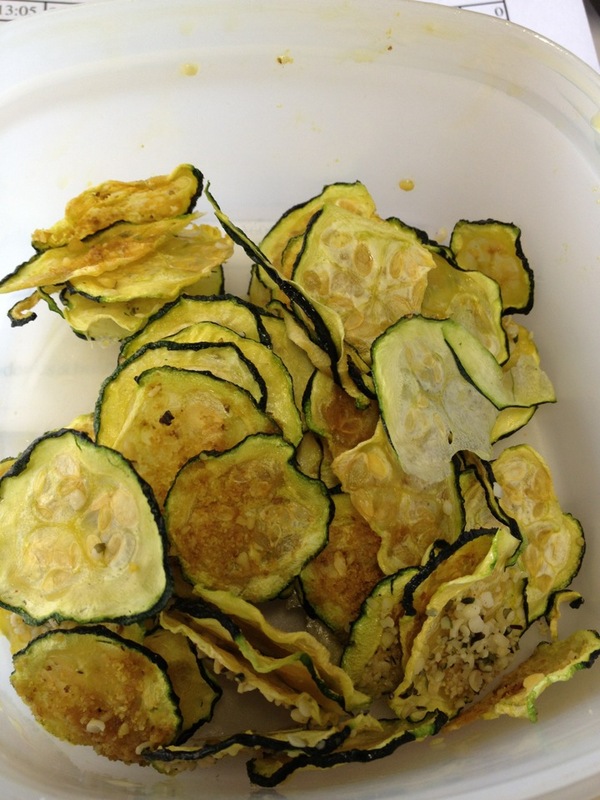 After about 6 weeks of having zucchini raw every 4th day I gagged and seriously could not. Eat. Any. more. Again. Ever. I was afraid I ruined it for us. But thing was I was just burned out on them and my body was rejecting them. So I skipped a couple weeks and then only had it sautéed. Which when trying to stay raw this summer sidetracked me. But then.....I saw a post on Facebook or a blog or pinterest or someplace about zucchini chips. Duh!!! So I tried it, had a few and then he ate the rest. :( so this weekend I picked up a few more and made them last night for today's rotation of this lovely versatile veg! Used my mandoline to slice them up, brushed evoo and then made some w/ smoke sea salt, some with sea salt & hempseeds & some with Parma which is vegan parm cheese. All winner winner zucchini dinner!! Yum!